Barcelona boss Luis Enrique says his side face Juventus in the Champions League at the "perfect time" after they claimed the Copa del Rey crown. The Catalan giants beat Athletic Bilbao 3-1 to secure the Spanish cup and will now go in search of a treble when they take on Italian outfit Juve next Saturday. The Serie A side are also seeking a treble after claiming the Scudetto and Coppa Italia titles and Enrique is looking forward to the European showpiece in Berlin. "We had a great performance against an excellent Athletic side," he told reporters. "We're in good shape and it's the perfect time to reach a challenge like the Champions League Final. "Now we will enjoy this Double, but from Sunday will immediately put our heads towards Berlin. "We'll see if we can beat Juventus too, though it will certainly be a tough match." 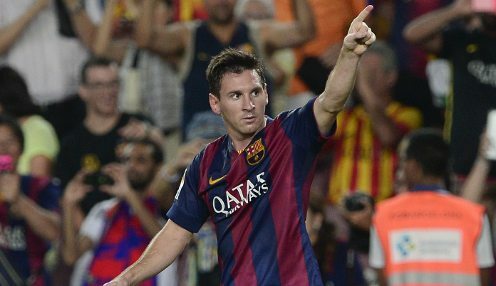 Lionel Messi scored a sensational opener against Bilbao and he is 1/1 to score the first goal of the game in the Champions League final. Barcelona are 1/1 to win 3-1 or 1/1 to secured a 3-0 victory. Don't forget, all Champions League matches are covered by the bet365 Euro Soccer Bonus, where you could earn a bonus of up to 100% on your returns on pre-match accumulator bets. T & Cs apply.